My Mom, Thelma A. King, a life long resident of Baton Rouge, was called home on October 31, 2018. Born to Nick and Effie Landry, Sr. on September 9, 1942, Thelma Landry attended Glen Oaks High. She married and had two sons that she was so proud of and loved dearly. Although she only had two sons, she was honored to have many more adopted sons that called her mom (Karl, Kevin, Rick, David and Phillip to name a few). Her biggest joy came from the grands (then the great grands!)! Known as Mamom, she played, taught and loved them all. Not one was left unspoiled! Whether you knew her as Mom, Mamom, Aunt Thelma or Cuz, she had a special way of making you feel loved and appreciated. Her generosity, big heart and willingness to give of herself tirelessly was her best gift from God. When not tending to her family she worked in accounting and finance, most notably at Sears, Roebuck & Co. She took pride in everything she did, striving for perfection and was continuously recognized for her work. She enjoyed cooking, fishing and camping. Mom was always excited about her upcoming trips to the coast to hang out with her cousins (oh how she loved her cousin time!). She loved the outdoor world God blessed us with and she spent countless hours praising and worshiping His glory on her front porch. Mom was always thinking of others and showered others with love and compassion. Her generosity was overwhelming and she never let anyone in need down. The last few years were truly a blessing to Mom as the Lord put some really special people in her life. Cousins Raymond Rivero (another son! ) and family and Lerlene Sicard (another sister! ) and family, opened their hearts and doors to mom. Together they shared so many laughs, tears and love. Mom was a parishioner of St. Isadore and was active with the Lady's Auxiliary for the K of C 4085 and led the Rosary, as well as Lady of Fatima. Thelma is survived by her son, Tim Beane, his wife Julie, his daughters and son in-law Marty and Alicia Collins, Olivia, Grace and son Timothy (T2); granddaughter, Danielle Beane; great grandchildren Destiny Beane, Alaysha Welsh, Kane and Mason Collins; daughter inlaw Tami Beverly Beane; one brother Nick Landry, two sisters Verda Ledoux and Virgie Berry; and several nieces and nephews. 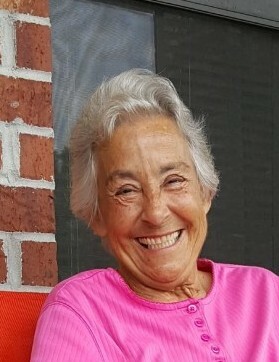 She is preceded in death by her son, Jeff Daniel Beane; parents Nick Landry and Effie Rivere Landry; sisters Myra Austin and Mary Landry; brother Keith Austin; nephew Chuck Berry; nieces Gloria Yammarino and Paula Berwick. Pall bearers are Karl and Kevin Vizinat, Phillip Rankin, Marty Collins, David Altman and Rick Bailey. Please join us in celebrating Thelma's life. Visitation is Tuesday, November 6, 2018 from 5-8 pm and again Wednesday 9-11 am. Rosary will be at 10 am Wednesday. Resthaven Garden of Memories. 11817 Jefferson Hwy., Baton Rouge, 70816. Mom, you were loved by so many you will be missed. I have been so blessed to have you as my mom.